These Farm Heroes level 240 cheats and tips will help you beat level 240 of Farm Heroes. 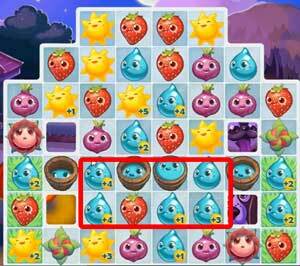 The objective of Farm Heroes level 240 is to collect 50 water drops, 50 suns, and six flowers in 15 moves. 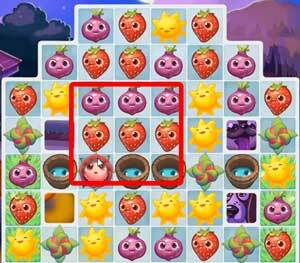 Farm Heroes level 240 gives you 15 moves to collect 50 waters, 50 suns, and 6 flowers. The flowers and buckets stop cropsies from falling very far, so you’ll want to collect your flower resources as early as possible. Try to collect them using water or sun matches, or use onions and strawberries to give your resources more value. From the very beginning you can start filling buckets as you try to clear flowers. 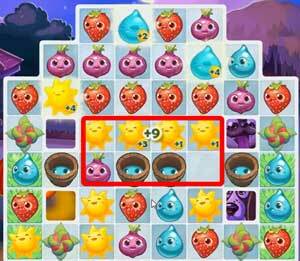 You’ll need plenty of water to match and collect your resources, so try to use sun and water matches to collect water until you have enough. Once you have freed up some room, you can work low on the board and on the grass to get bonus resources and allow more cascades and matches to happen with each move. The best part is that you can work low and still clear any leftover flowers, fill buckets, and use the grass at the same time.